Recently we saw a lovely patient who travels across town to see us, who had some extreme thinning of her molar teeth on one side of her mouth (tooth erosion). There were very large defects into the enamel and softer dentine of the molar teeth, which was not caused by decay (bacteria), but from too much acid (chemical wear). We puzzled over this for some time. She wore a night guard (occlusal splint) every night to lessen the damage and wear from teeth grinding. She had no gastric reflux history, took no medications and had a very healthy diet, and could not recall anything that was acidic in her diet. Ascorbic acid in Vitamin c chewable tablets is acidic and can dissolve tooth enamel and dentine away in an irreversible way. After much discussion we isolated the cause of the loss of tooth structure to Vitamin C tablets that she ate religiously and chewed on the side of her mouth where the extreme erosion was found. In actual fact most Vitamin C tablets are made from ascorbic acid, which erodes the tooth structure causing irreversible damage and weakening of the teeth, and predisposing them to decay. Most chewable Vitamin C does more damage to the teeth than eating sugar. At that level of acidity the Vitamin C tablets are more corrosive to tooth enamel than sugar. Sugar is also a problem because it feeds bacteria in the mouth that can cause cavities. Ascorbic acid is good for you because it functions as Vitamin C in the body. However there is a better form of vitamin C called buffered vitamin C. It is PH-neutral or ascorbates, and not acidic in nature, and used in chewable form they are not damaging to the teeth. They don’t taste quite as good because ascorbic acid tastes tart, while ascorbates taste bitter. We can not manufacture Vitamin C in our bodies we must obtain it in the diet. When we take ascorbic acid our body reacts it with a mineral to properly utilise it. A gram (1000mg) or two per day is not going to be an issue for most people, however there are some people in which acidic vitamin C upsets the stomach. High dosage levels, around 6,000 mg daily, is adding to the load of acidic substances and depleting the body of the minerals required to cope with the acid load. The acid/alkaline theory of health indicates that most people already ingest too many acidic substances, causing an over-acidic condition, which may lead to disease. Buffered vitamin C is made by reacting ascorbic acid with a mineral which becomes calcium ascorbate, and some are mixed mineral ascorbates which include magnesium ascorbate, potassium ascorbate, zinc ascorbate, etc. 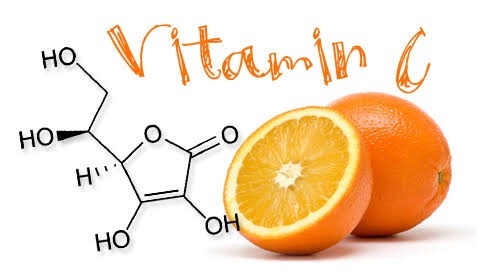 Like all nutrients, Vitamin C does not occur in isolation, but is coupled with bioflavonoids which then function as antioxidants, and serve to support connective tissues. A deficiency of both can show up as bruising easily. Flavonoids keep the veins and capillaries strong to prevent spider veins and varicose veins, thus promoting circulation. We know that vitamin C helps to prevent colds and scurvy. It is also used in hundreds of metabolic functions in the body. At a dose of 500mg, vitamin C gives the maximum elevation of your glutathione levels, an important element of your immune function and detoxification pathways. It is best taken with food since vitamin C with a meal can increase iron absorption greatly. If a fatty meal is eaten as little as 500mg will prevent the thickening of the blood that occurs. Higher doses may not elevate immune function much more, but it can have other therapeutic effects. For example 6 to 12 grams, divided throughout the day, can fight most forms of infection in the body from colds and bladder infection to abscess and prostatitis. It reduces LDL, or bad cholesterol, and elevates HDL, good cholesterol. Symptoms of scurvy, or extreme vitamin C deficiency, are fatigue, bleeding and bruising easily, weakening of blood vessels, and hair and tooth loss. We can get enough vitamin C from fresh fruits and vegetables , if you consume fresh fruit, which of course is plentiful in Queensland. Ingesting 250mg to one gram daily reduced the occurrence of the common cold by 50%; 500mg daily improved blood vessel dilation helping to protect the heart. Other studies have shown a lower risk of cancer at lower dosage levels. It is a personal decision based on your health and your intake of fresh fruits and vegetables as to how much Vitamin C to take. Certain drugs, including anti-depressants and oral contraceptives, alcohol and especially tobacco, deplete vitamin C from the the body. Consistent excessive intake of isolated nutrients can lead to the body using it less effectively, which has been shown to be true with vitamin C as well. The person who takes 15 grams daily will be more prone to showing signs of scurvy faster when they are no longer able to acquire, or just stop ingesting that much. On a more reasonable dose of say 2 or 3 grams per day, will not have this effect known as “rebound scurvy”. Pregnant women should generally take no more that 5 grams daily or the infant could become dependent and also apparently develop scurvy too easily. Aside from damage to tooth enamel from chewing ascorbic acid tablets the other worry would be if one has too much iron in the blood, since vitamin C increases iron absorption from food up to 40%. In Australia where fresh fruit and vegetables are readily available following the two serves of fruit and 5 serves of vegetables per day, as per the 'Go for 2 and 5' dietary campaign should be well adequate for vitamin C intake, without any need for vitamin supplementation. Look out for produce which is not fresh and has been stored for long periods of time, as some have been found to have no vitamin C within it. We sort out every single dental issue and can help with dietary tips, especially firm and gentle instruction for teenagers who may decide they have liked an unhealthy diet.